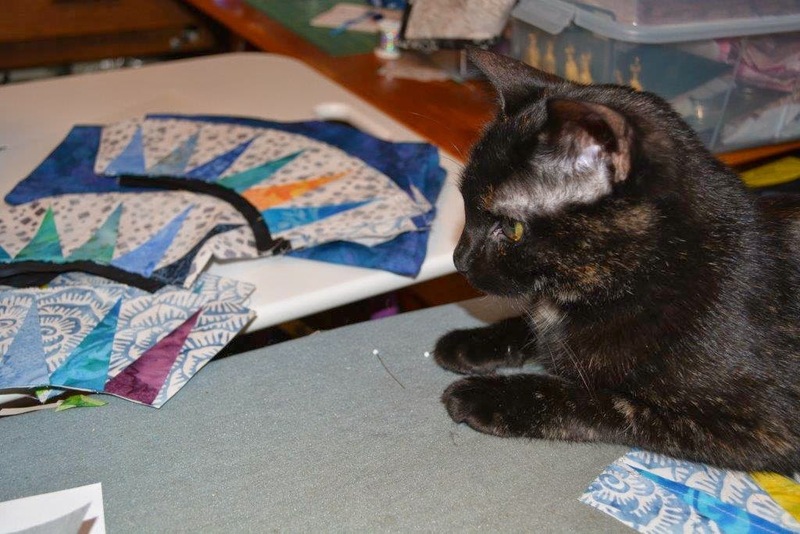 I love it when quilters share pictures of projects they've made from my patterns. Here is Paulette, a member of the amazing Guilde Acadienne de Clare, showing off her Santa's Trip Around The World quilt. I understand that Rudolph's nose actually sparkles! Paulette has done a great job on the appliqué and I love how her border is quilted - it helps move our eyes around Santa and his reindeer. It's a prime example of my theory on quilting: quilt what you want people to see. The pattern for Santa's Trip Around The World is available from my website, or locally at Mrs Pugsley's Emporium. Thanks so much Paulette for sharing your talents. It was a loooooooonnnnnngggg time coming, but spring appears to be slowly seating itself in. Even though we haven't unwrapped the hives as yet (we had snow this week!!) the bees are out flying around and looking for pollen. 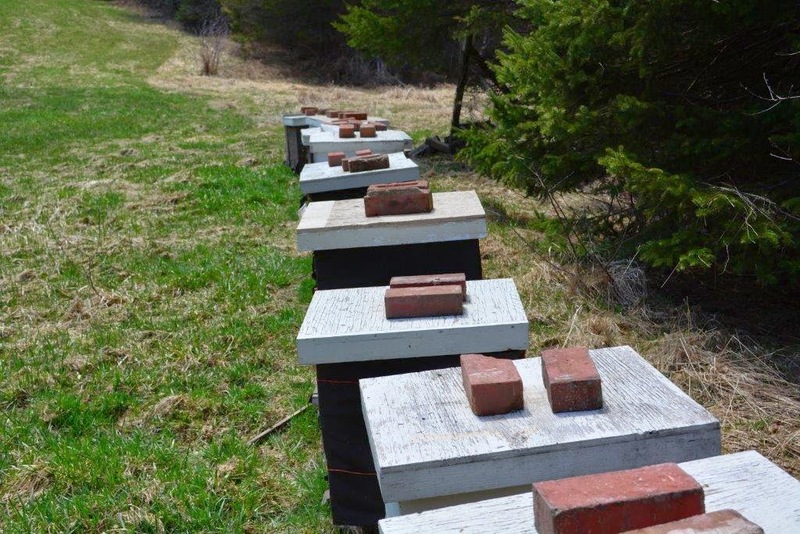 To that end, my beekeeper hubby gave each hive a little head start with 2 pollen patties each. 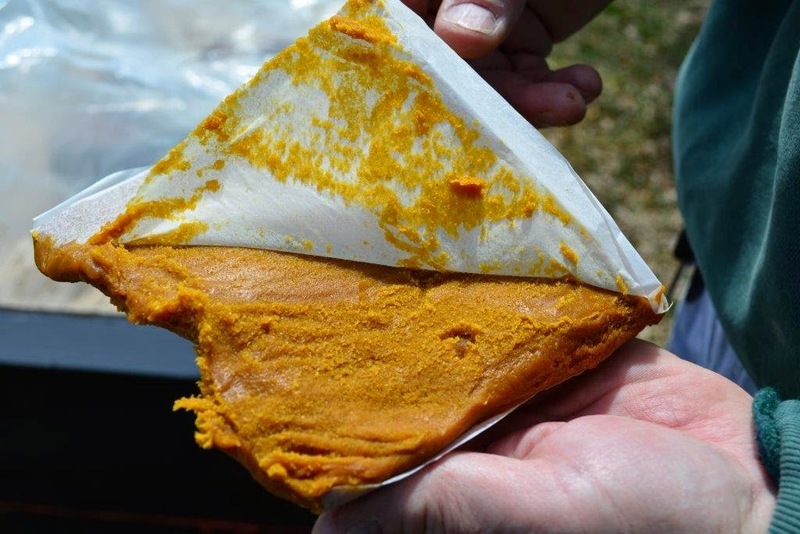 These pre-made patties are purchased at the bee store wrapped in a special paper through which the bees can chew their way in. Pollen will signal the queen that spring is here and that it's time to start raising brood again. 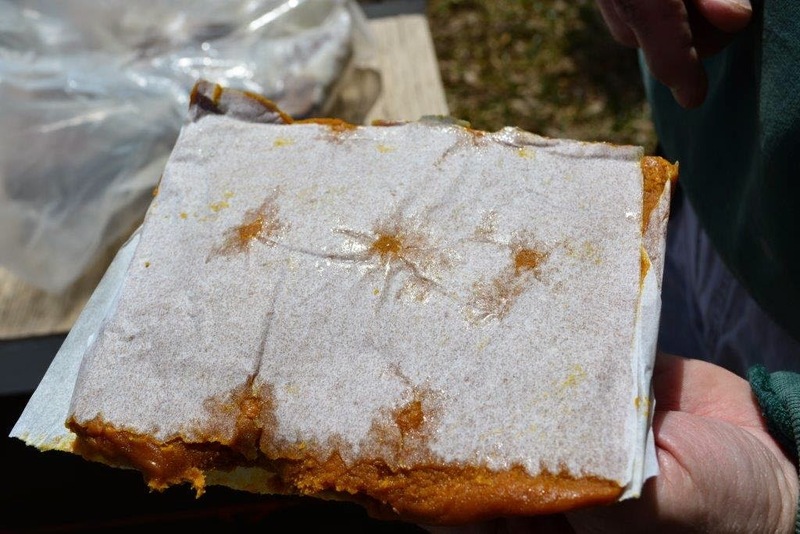 There are little holes left in the paper so the bees can easily get started. Doesn't that look tasty? This, and a little sugar syrup which will probably go out next week, should be enough to tide the bees over until buds start popping open and pollen begins appearing in nature. "Is this thing lying flat? I doubt it...my piecing was probably off...or maybe my pressing. Did I have it smoothed out enough when I pinned it? I don't remember smoothing it before I taped the edges, but I must have, right? Gosh, did I use enough pins? I used up all the big ones in the container but I bet there were more upstairs -I should have checked. Is there such a thing as too many pins? I rushed through the basting because Polly was being such a nuisance she had to be put outside and then she was at the window looking pitiful and wanting in and I felt guilty. 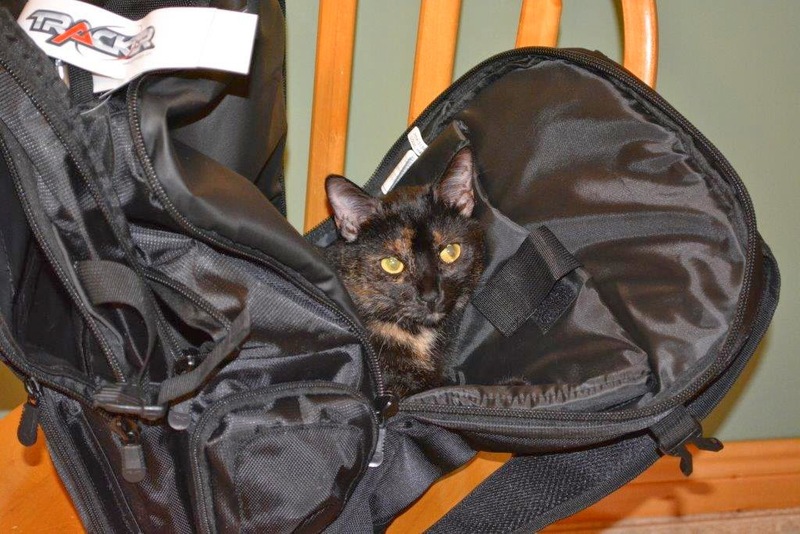 I should have left her out there, it was a nice day... Did I check the back thoroughly for puckers before I closed all those pins? I bet I didn't. Sigh...it looks so lumpy on the machine bed. This is not going to work..."
Over 26 years doing this full time and this is still the conversation in my head each time I start. Do you do this too? One of the fun parts about quilting is showing off the finished product afterwards. I happened to be in Mrs Pugsley's Emporium one day when Patricia Carson brought in her version of my Selvedge Tote. 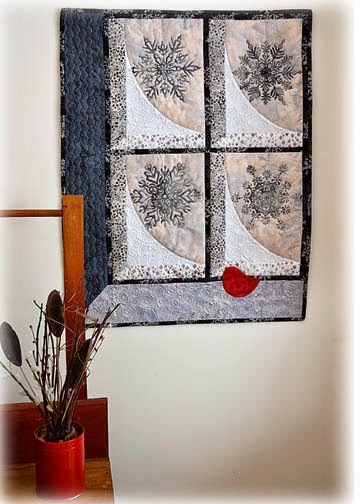 Even though there are a lot of these around each has its own unique appeal and made personal with the quilter's saved fabric edges from past projects. 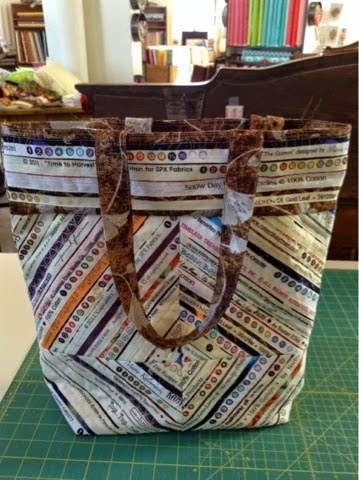 Patricia gave her tote a couple of extra touches; see that orange strip on the left? 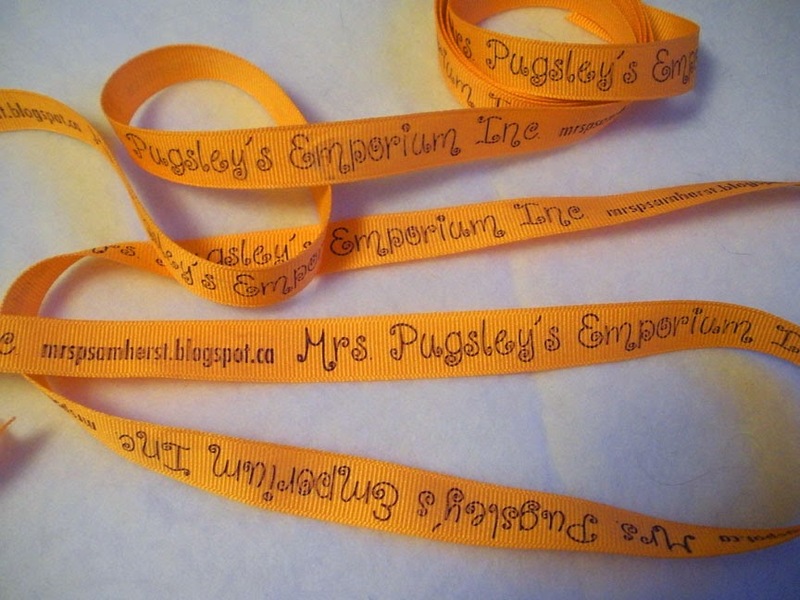 It's a piece of Mrs. Pugsley's personalized ribbon. Clever! 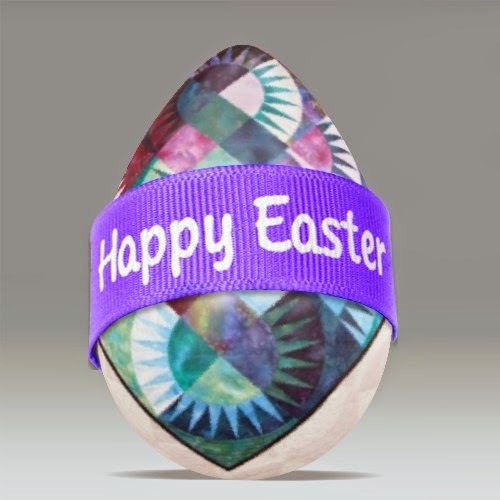 Thank you Patricia for sharing your creative talents. If you'd like to make your own Selvedge Tote, the pattern is available at Mrs. P's, or from my website. 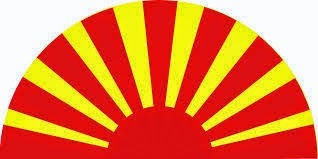 "Sunrise" is a word I associate with Easter as often the day is marked with sunrise services. 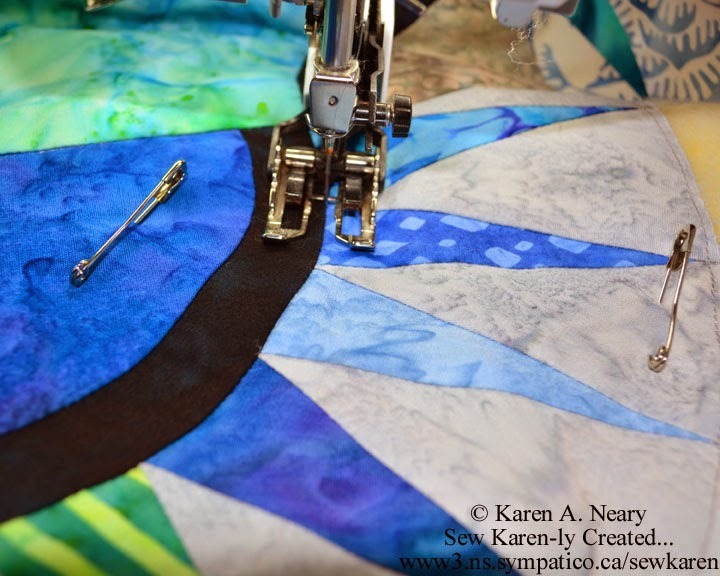 Here's an article in the Truro Daily News on a different kind of sunrise - The Sunrise Quilt Guild - located not too far from here. Way to go, ladies! Here's an update on Taylor's quilt; I really appreciate that her Mom and great-grandmother allowed me to share this photo. First off, look at this sweet baby who is only a little over a month old - it's amazing how bright and active she is! That aside, from my perspective there are a lot of things I like about this picture. For starters, not only is the quilt being used, it's on the floor. I love that. Think about it: when you put a quilt on top of a baby to sleep, do they ever get to see it? Taylor can play on this and when she rolls over - as she will do soon enough - will be able to look at lots of bright colours, and her name. The quilt can be machine washed and dried, no problem, so when it needs to go back on her bed it's all good. I could not be happier it is being used as intended. Secondly...there's a very content looking cat in the photo :) Mia is only a couple of months older than Taylor and has been welcomed in to the same family. It's all good! Thank you Jacklyn and Nancy for sharing the picture. The wind is blowing a gale outside and with two cats in the house, I knew that even before I opened my eyelids this morning. Gram always said the cats go crazy when there is wind and Polly is a wild woman today... she`s been into everything. 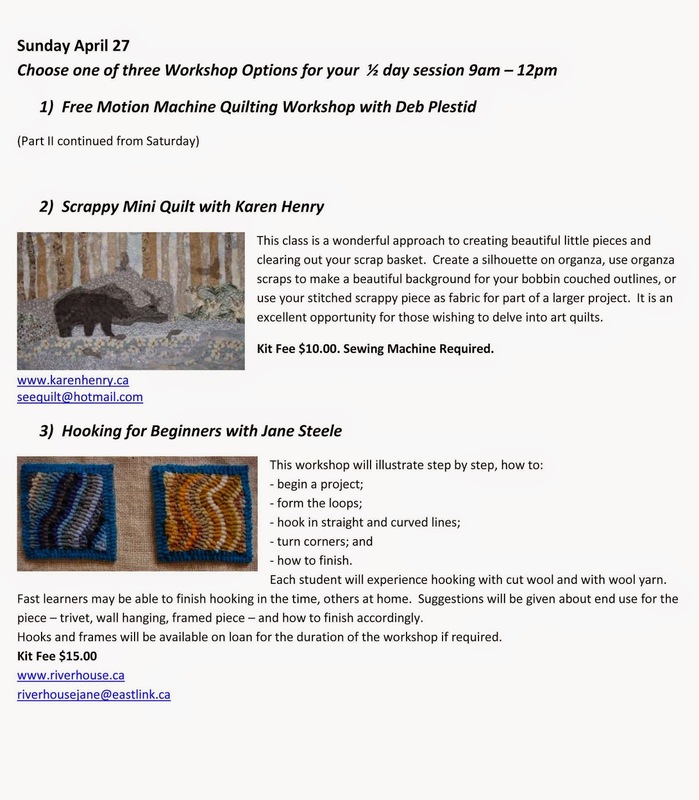 It`s no small honour to have my quilts go and I am really pleased that there was opportunity to show both of them first here in Amherst, Nova Scotia. They've been on display for the past month at Mrs. Pugsley`s Emporium. I am home today waiting for UPS to come pick up the box. While I wait, I will stitch on the latest design. 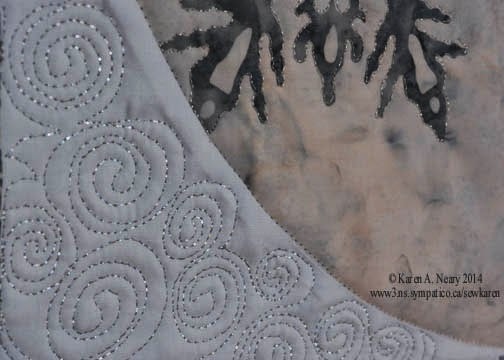 This will be the last I can show of it for awhile as I am pleased to say it will appear in the fall issue of Quilter`s Connection magazine, Canada`s premier quilting publication. Look at Polly: ears up, eyes intently focused, killer instinct engaged.. Be careful Maddie, I think she`s ready for another round! 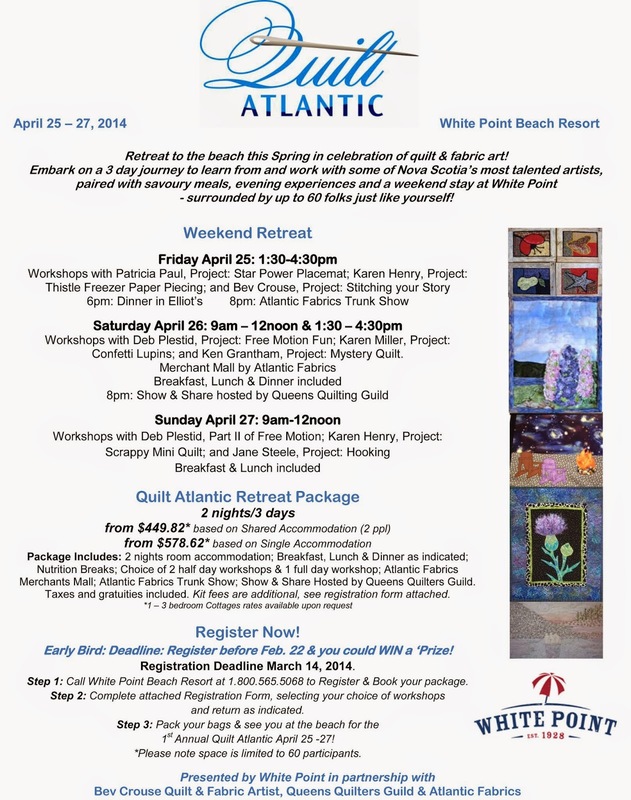 If you are looking for a quilty treat this spring, check out Quilt Atlantic at White Point Beach resort. (Click to enlarge). If you'd like more information, contact Bev ; I know she would be delighted to answer your questions. Literally. And posted them on their blog...along with the pictures I took. Maybe it was just a dream that I wrote those posts...and that my name is actually "Slightly Off Quilter"??? Granted, many days I am a bit off, but not so much that I don't recognize what I've written and where I've posted it. For those of you interested, please read about this on The Bitchy Stitcher site (some days I am this way too). A sincere thank you to Linda for the heads-up about all this deceit. 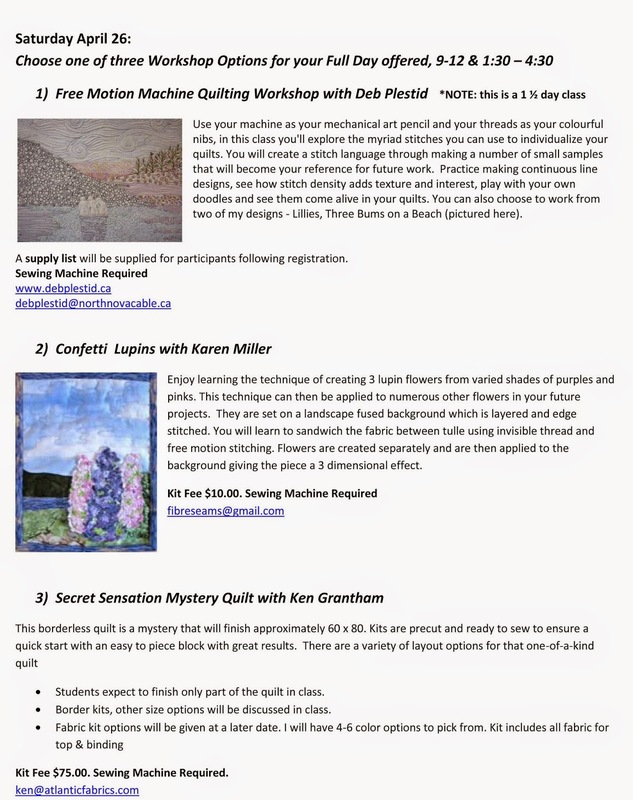 If you do visit the quilt patterns pro site in question, please know that I am NOT affiliated with this site in any way, shape,or form, I do NOT write for them under another name, and they do NOT have my permission to lift material from my blog. Be careful what you click on there; the site is peppered with ads which will take you who knows where. I will also be lodging a complaint with GoDaddy, who apparently hosts the site's domain. I've drawn up another New York Beauty design to use with these fabulous batiks. I *love* the colours and am itching to get stitching. I'm not quite ready to do so as yet though; I need to walk around the fabrics and the design for a day or two to make sure everything is where I want it to be. 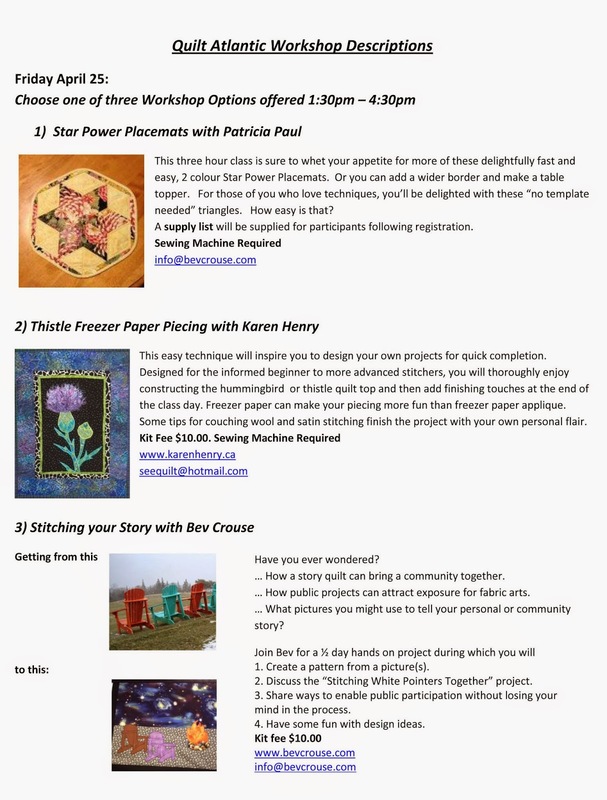 This coming Wednesday - April 9th - my machine and I are heading to Mrs. Pugsley's Emporium for a drop-in sewing day. It runs during store hours from 10-4 and I plan to be there the whole day. There are more details here from Mrs. P. herself. If you are in the area please join us for a fun day of sewing, or even just pop in to say hi. I'll be working on my NY Beauty blocks! 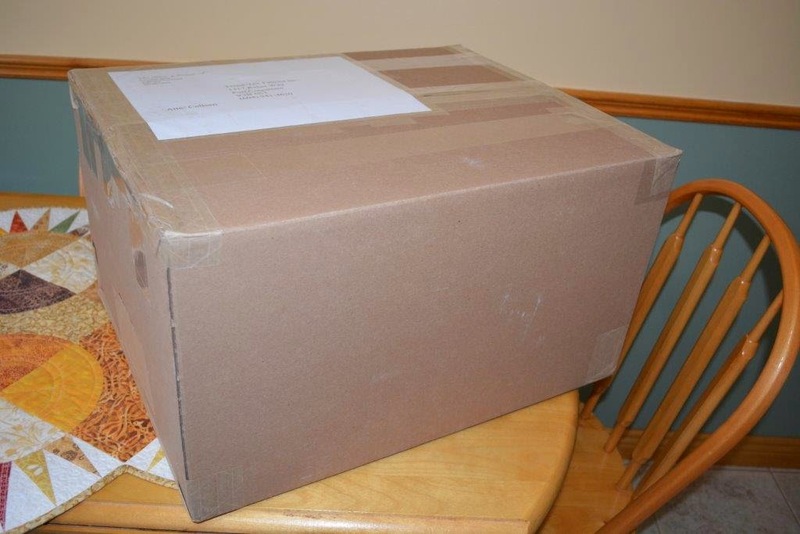 The second of the baby quilts has been lovingly delivered and gleefully received. 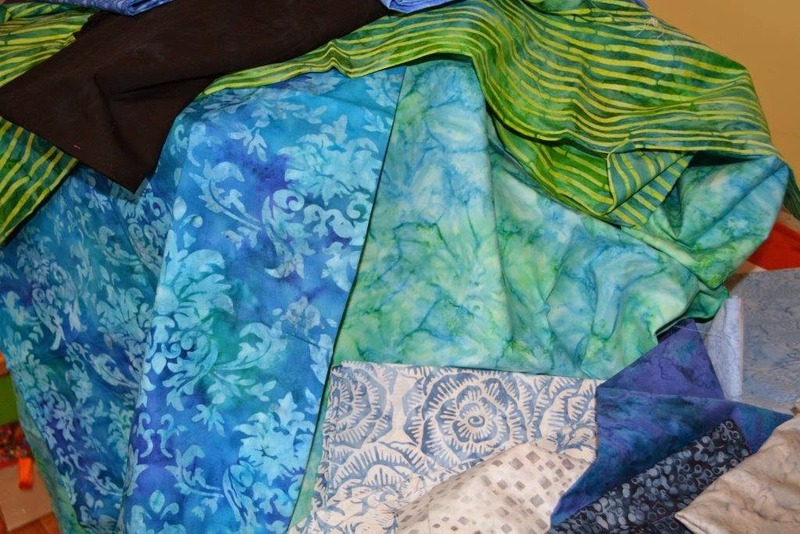 I used the same selection of pre-cuts of Stof fabrics as in The Quilt Of Learning (Peppered Shadow Brights Maple Roll (2-1/2" strips). To get a random placement of colours in the blocks, I cut the strips into several shorter sections and shuffled them around a bit.The short strips were sewn together in pairs and then cut into 2-1/2" sections. This is much easier and faster than working with individual squares. These 2-1/2"sections were sewn into 4 patch blocks which finish to 4". The blocks were laid out 9 across and 8 down to give an unfinished measurement of 36-1/2" wide x 24-1/2" long. Stof Quilter's Shadow fabrics in yellow and red were used for the trim; a yellow 6-1/2" x 36-1/2" was sandwiched between 2 red 3-1/2" x 36-1/2" strips. Another 3-1/2" x 36-1/2"red strip was added across the bottom of the quilt. 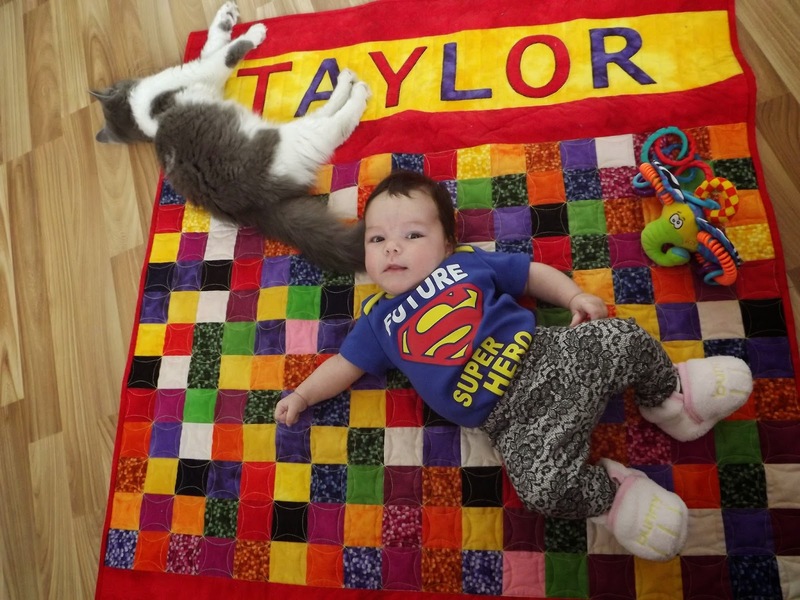 Letters from the Quilt Of Learning pattern spelled Taylor's name in red and purple. Machine blanket stitch was worked in black thread around the letters. The quilting was fun - lines and squiggles and curves. 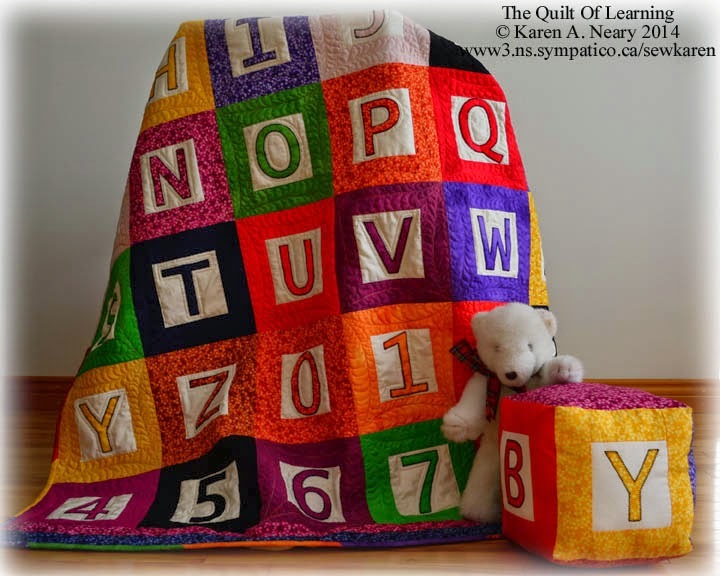 I can picture giggles when she sees her quilt smiling back at her in the letter O. 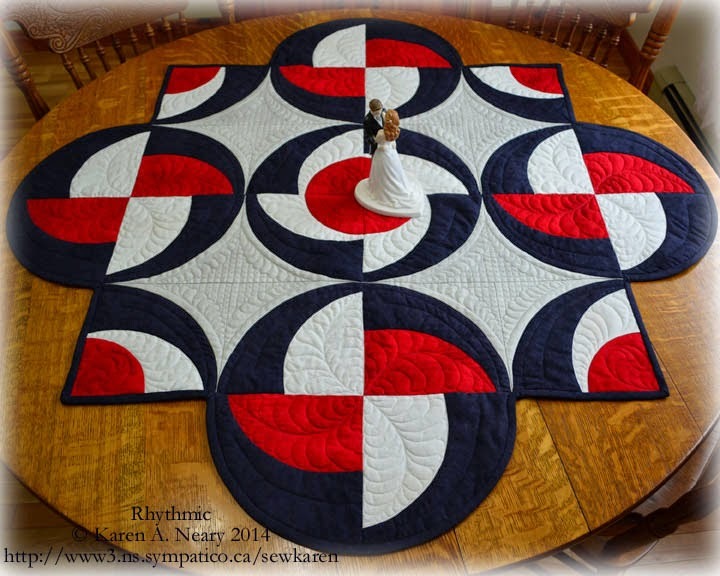 The squares were simply quilted in a continuous curve over the body of the quilt. Choosing a thread colour made me pause for a moment, but I finally decided on a soft yellow 50 weight cotton (good and sturdy). On the back I used a super soft flannel with little yellow ducks, and finished it off with a red binding. I am told that month-old Taylor's favourite colour is red. Unfortunately I didn't have this finished when Taylor came to visit us last week, but her Papa and GG have it now; it will remain with them as a special quilt for Taylor for when she visits her great-grandparents. 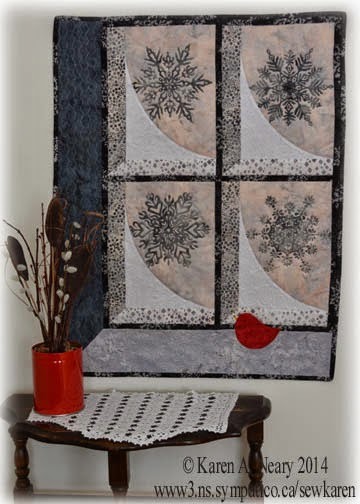 The printed snowflakes remind me of the ones Nancy used to crochet and starch and hang in her windows. If you look closely at the picture below, you can see that I have stitched a hanging cord from the top of the snowflake. 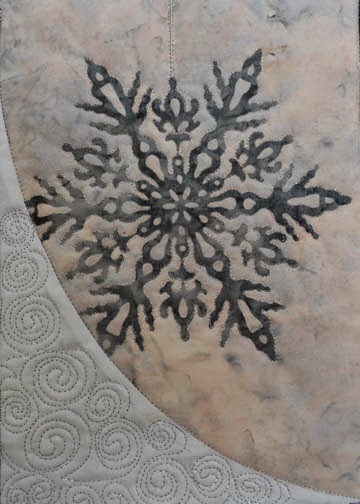 The snow is quilted in swirls with a holographic thread which gives a nice shimmer; the snowflakes themselves are outlined in silver metallic. 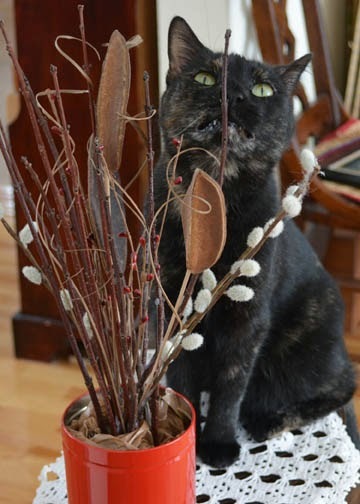 For the photo shoot I placed some cattails in a red can...which turned out to be a bad idea with the cats in the house. They were obsessed with those cattails!! It was a constant struggle to keep Polly off the table long enough to get a picture; I would shoo her off and by the time I had the camera in position, she was back at them. Maddie, whose feet are permanently glued to the floor, stood on his hind legs beside the table to reach up and swat them. This was a super easy project and took no time to stitch. The snowflakes will be in stores soon, and are sold by the yard so you can buy as few or many as your project requires. In Canada, they are distributed by Trend-Tex Fabrics. I am very pleased with the look, especially with the red accent from the little bird, and have named the piece "At Nancy's Window." The pattern will be coming along shortly.